You can find this Fully Loaded 2014 Ford F-150 Lariat Crew Cab Long Bed 4x4 Pickup Truck and many others like it at Trust Auto. CARFAX BuyBack Guarantee is reassurance that any major issues with this vehicle will show on CARFAX report. Sophistication & understated luxury comes standard on this Ford F-150 Lariat. Well-known by many, the F-150 has become a household name in the realm of quality and prestige. This 4WD-equipped vehicle will handle majestically on any terrain and in any weather condition your may find yourself in. The benefits of driving an Four Wheel Drive vehicle, such as this FordF-150 Lariat, include superior acceleration, improved steering, and increased traction and stability. The easiest choice in purchasing a new vehicle is choosing one with a complete and detailed history like this gently driven pre-owned vehicle. 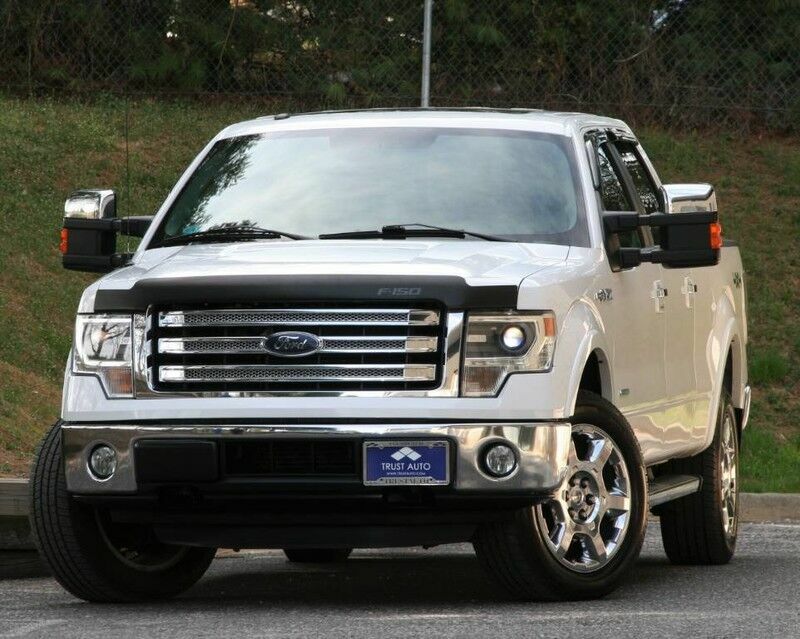 This wonderfully maintained Ford F-150 is in the top 10% of its class when it comes to cleanliness and condition. Equipped with many extra features, this well-appointed vehicle is a treat to drive. Added comfort with contemporary style is the leather interior to heighten the quality and craftsmanship for the Ford F-150 Find the quickest driving route in this Ford F-150 Lariat using the installed navigation system. This nav system is one of the easiest to use and will help get you where you need to go quickly! You know the the previous owner washes and polishes the vehicle with great care and detail? It's in impeccable condition. More information about the 2014 Ford F-150: With three cab styles, three different bed lengths, and a wide range of models and optional equipment, there's an F-150 configuration for every truck need. Ford also boasts that its F-150 has the only full-size pickup with 6-speed automatic transmissions across the entire lineup. Another feature that stands out, even against rival models from Ford, Chevy and GMC is MyFord Touch, an all-encompassing connectivity and infotainment system. This model sets itself apart with A model and configuration for every truck need, standout refinement and ride comfort, fuel-efficient powertrain lineup, and strong towing and payload ratings *30 DAYS / 1000 MILES POWER-TRAIN WARRANTY INCLUDED (ENGINE, TRANSMISSION, DIFFERENTIALS)* *TRADE INS ARE WELCOME* Trust Auto is one of the top pre-owned vehicle dealer in Maryland. We provide quality vehicles of various makes and models with the most competitive prices in the region. Trust Auto is dedicated to make your vehicle shopping experience hassle free and straight forward. With that in mind we fully inspect, service and detail all cars in the lot. We are open 6 days a week now FOR YOU!!! Monday - Saturday 9am - 7pm. Some vehicle information and pricing may be unintentionally missing or inaccurate, and Trust Auto will endeavor to correct such discrepancies in a commercially reasonable manner after being notified of any errors. Pricing errors and listing errors are considered invalid and may not be honored at the sole discretion of Trust Auto. Prices subject to change without notice and do not include Title, License, Registration Fees, State or Local Taxes, $895 PDI & $299 Dealer Processing Fees. Please contact seller for vehicle availability. All vehicles with PDI are sold with a 30 day / 1,000 mile warranty! EPA mileage estimates are provided for comparison purposes only. Actual mileage may vary depending on driving conditions, driving habits, and vehicle maintenance. Mileage listings are estimates and are not necessarily accurate odometer readings.